Search queries are the words and phrases people type into the little box on Google’s home page. If you want more website traffic, you have to know what people are searching for. You can’t leave it to chance you need a strategy or system in place. Why people search Google ? 2. What Questions Do People ask? People use Google to get an answer to the question or search query they type in. Google want to give searchers the best, most relevant results. Sometimes the best answer is an advert, a map or a result from a property Google own and not a page from your website. You have to figure out 3 things. What are people searching for and why ? Are they clicking onto the search engine results pages ? Are there enough people clicking each month to make it worth your while ? You think you know what people are searching for; but why guess or leave it to chance ? The most reliable way to find out what people search for is to use keyword research tools that are independent from Google. Remember, Google make their money selling adverts next to the organic search results . Google’s free keyword tools are provided for advertisers not SEO experts. Since there are already answers or pages in the top 10 of Google, you then have to figure out how to knock them off their throne. The following are 11 search queries types people make that have commercial intention. Once you know the search query and intention then you can create content that can help rank and earn organic traffic. The search query “best X for Y” works for every product, service or company. Best Dress For Mother of the Bride. Best golf improvement irons For a 15 handicapper. Best WordPress theme For a travel website. I was developing an online training course a few months ago. I needed to produce more authentic content with my face on screen. I wanted to produce myself rather than hire a video production company. I knew my son had a tripod for his skateboarding but could not remember the brand or product name. If you’ve ever filmed with an iPhone or lived in Scotland, the natural light is not great in winter. A lot of YouTubers were talking about their ‘rig” or what they use to produce content. There must be over 1000 mentions of portable lighting on YouTube videos. I redesigned my ex wife’s website a few weeks ago. I looked for some opportunities for her. Since she applies gel polish onto customers nails, ranking for this opportunity makes sense. 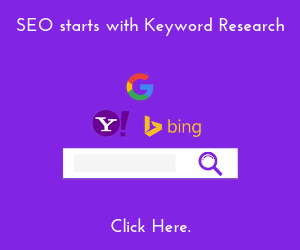 Firstly, there are 2800 searches a month and keyword difficulty is low. So a good chance to pick up traffic from Google. Secondly, this is a great piece of content she could share socially to demonstrate her product knowledge and expertise. Third, if other people in the industry or the brands find her page, there’s a chance they’ll link to it. The end result being a page with a better chance of ranking high and more organic traffic. 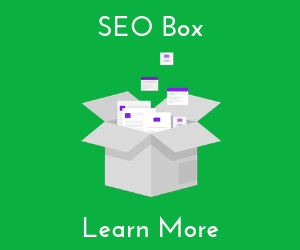 I can take any keyword and find out the questions people have relating to that seo topic. For fun, I wanted to see what questions people in America had when they searched for “Scotland”. 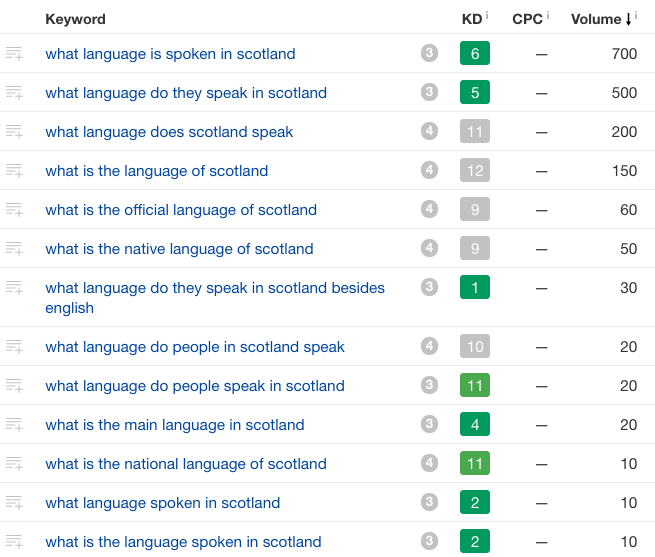 I was surprised to find out that over 1400 people in the USA a month search “what language is spoken in Scotland”. Just because you know the answer never assume prospective customers know the answer. Do you know the currency of Croatia without Googling it ? Well neither did I until my son planned a holiday there last year. Key questions and answers around a topic form an ideal way to earn traffic to your website. If you don’t research the questions people have, you won’t know what answers to create. And you’ll miss out on potential traffic. When I am stuck, I’ll search Google and look for bloggers or magazines in my industry. eg: google “marketing blog uk”. Then I will review what they are writing about. It’s very easy to get caught up in your own little world. Can’t see the woods from the trees ! 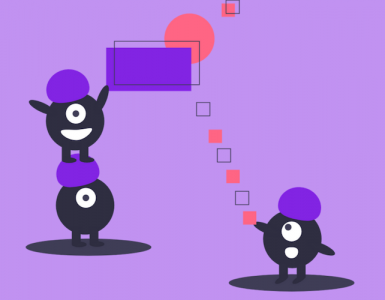 I just looked at marketing donut – a marketing resource website. I looked at their top ranked pages. I do not write content about any of those topics. 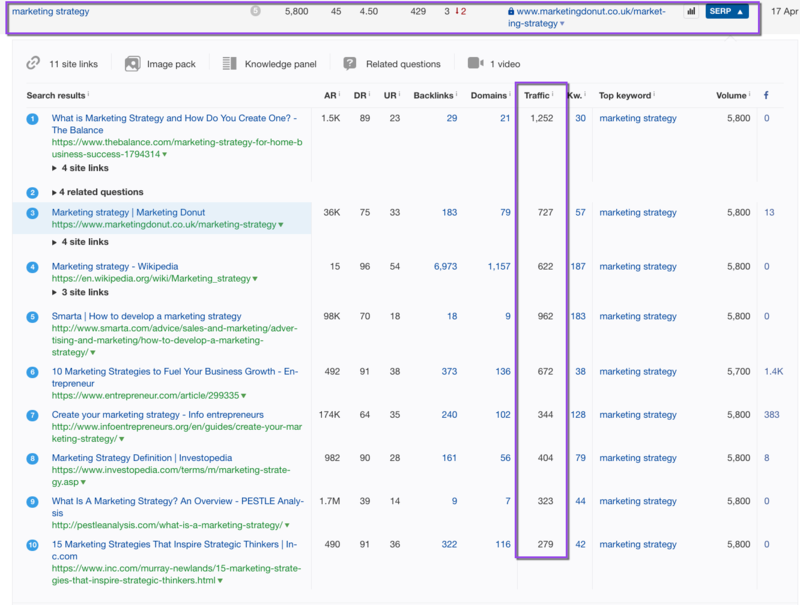 Why haven’t I pinched these topics or keywords from bloggers in my niche ? Because I did not research them. 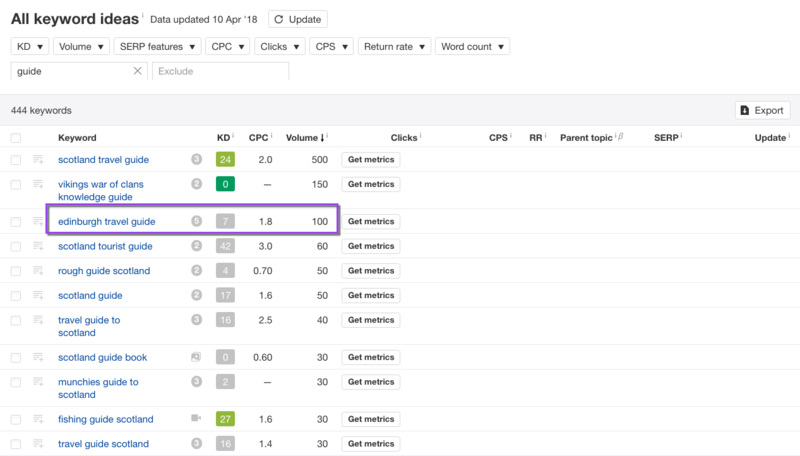 A really simple keyword research tactic is to analyse a competitor or blog and look at the keywords they rank for in the top 10 search results. What you will find are keywords with high search volume. The search volume looks really attractive. Next you’ll check the top 10 search results to see the clicks these top pages get. But most highly searched keywords are hard to rank for. I’d love to write something about “marketing strategy”. 5800 UK searches a month. The top ranking pages get 560 a month on average to their website. But the keyword difficulty is 45. This is simply too difficult for me to get ranked in the top results. I’d also need to consider the intention of someone searching for marketing strategy. Is this a student doing research or a prospective customer looking to hire a person to help them develop a strategy ? If I narrowed down the difficulty of all a competitors ranking keywords, then I can find more realistic ranking opportunities. 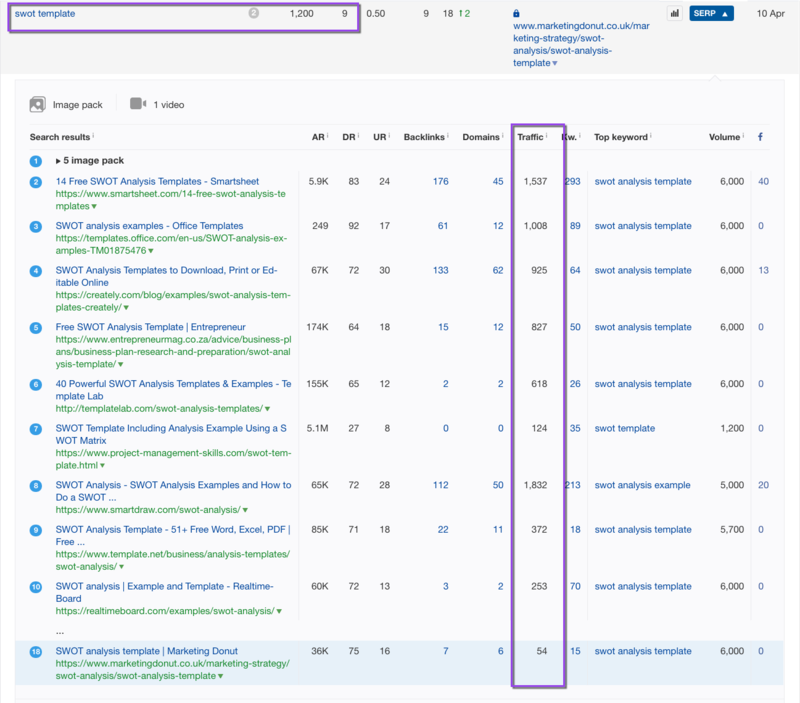 If I look at search queries with a difficulty under 10, I have a better chance of ranking. This topic is 100% relevant for my website. 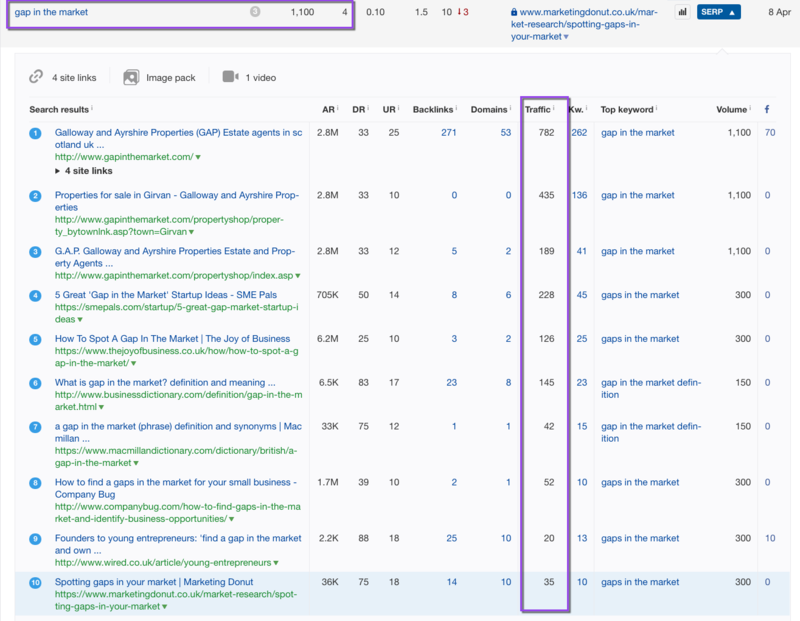 As I write this I’m contemplating changing the focus of this post from keyword research to gap in the market. The keyword difficulty is 4. So I only need about 4 or 5 links to rank in the top 10. And the average top 10 page gets 200 visits per month to their website. A similar tactic is to find a competitor or industry website with a domain that is not as strong as yours. Then look for the keywords they rank for that are in positions 11 to 20 and have low keyword difficulty. This search query has 1200 searches a month. It has a difficulty of 9. And the pages in the top 10 results have on average 750 visits per month. Could I write about this and produce a helpful resource ? This topic is marketing 101 for a guy with a marketing degree like me. I’m working on a web project at the moment. The previous web agency literally threw up a website and hoped for the best. It’s obvious they did no research before they produced the website. It’s fairly obviously the client or agency do not know what prospective customers are looking for. If they did, they would rank well in Google and have more organic search traffic. And they’d have more customer enquiries. I just finished analysing their competitors pages. I’m not stealing anything, I’m reverse engineering their competitors’ websites. Their website work, Google like it, it ranks well and Google reward it with organic traffic. Why shouldn’t you reverse engineer something that already works ? You can look at 3 or 4 big websites in your industry and compare their website with yours. These websites might be blogs or industry associations that create a lot of content relevant for your audience. You can find out what content they have created that you don’t. You can find out the search queries that produce clicks to their website. Then you can produce similar content based around those searches. I have a couple of in depth supplier review posts on my website. I’ve had a couple of hundreds visits in the past 2 weeks to one supplier review. Your customers could be searching for your suppliers then looking for you to install or customise that product or solution to your needs. Positions you as an expert. Lots of easy to rank search opportunities. Helps prospects evaluate products before buying. Many brands or products owners don’t know their product like you do so you can produce better content. Start auditing and thinking about all the products or suppliers you work with that you could potential write about. Look at their best pages and the search queries that drive traffic to their website. I built an online training course a couple of months ago. I was toying between 2 solutions; Teachable and Podia. 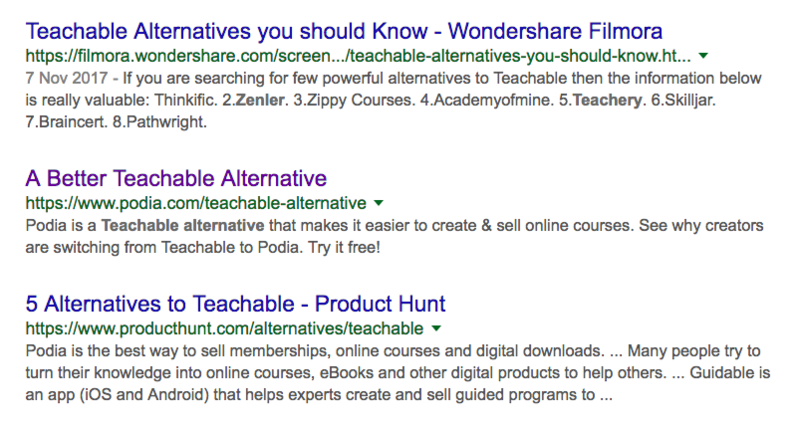 I did a Google search for “teachable alternatives” and look at the number 2 organic search result. The mindset of the searcher is that they are unsure about what to buy or choose. Unless you have a monopoly in your market, I guarantee people are looking for alternatives to a supplier or competitors product. Therein lies your opportunities to position your website in the search engines for these searches. Just be honest and respectful about the features and benefits of alternative products. 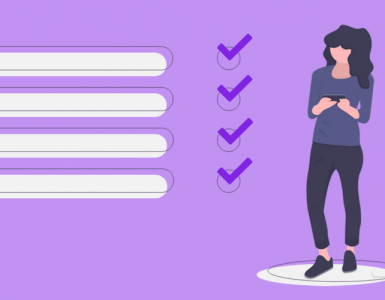 These type of search queries are similar to alternative search queries but the user is looking to compare the features and benefits of 2 or more solutions or products. 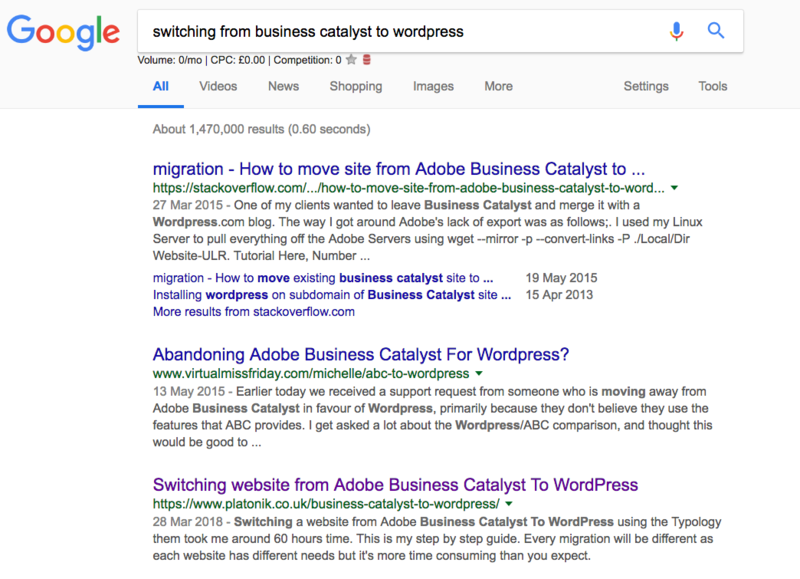 If you search “adobe business catalyst vs wordpress 2017″ you will find me at number one in Google. The I’m a PC, I’m a Mac campaign is probably one of the most successful comparative advertising campaigns ever. Apple pitched each feature of a PC and compared it work a Mac feature. You could also provide a page of content to compare product X v Y v Z. 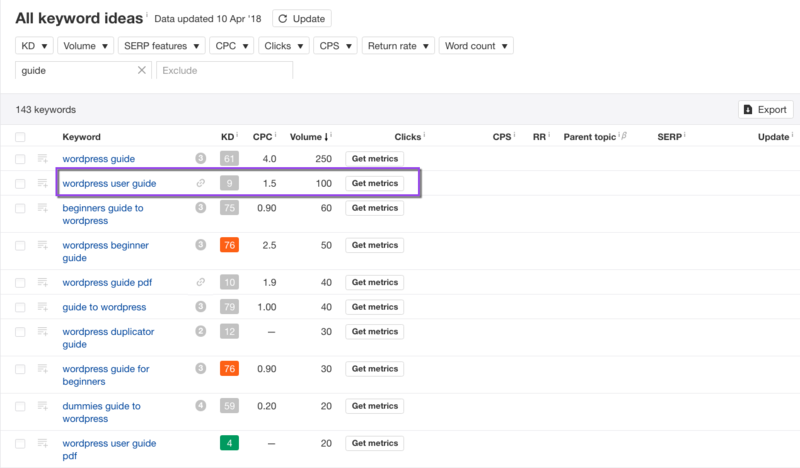 Similar to question searches, only this time you find keywords that include “guide” in the query. I migrated my website to WordPress recently. I could create a helpful WordPress guide. Oh, just remembered, I did create a guide for switching to WordPress. But I don’t want to assume I know what people are looking for. There over 99,150 searches relating to WordPress in the UK. Filter down these searches so they only include the word “guide“. “WordPress guide” has 250 searches a month. But difficulty of ranking is 61. 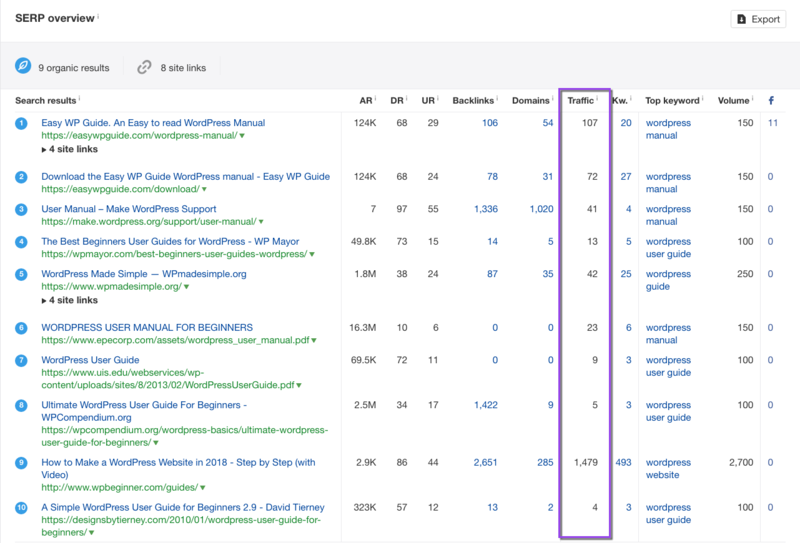 “WordPress user guide” has 100 searches a month. Difficulty of ranking is 9; that’s low. I then looked at the top pages and their traffic. Perhaps not the greatest opportunity but all the top pages do earn organic traffic. Let’s try another ‘guide’ search query. This time for “Scotland” related queries. 269,250 search queries that include the word Scotland. Let’s filter down those searches that include “guide”. “Scotland travel guide” has 500 searches a month. “Edinburgh travel guide” has 100 searches a month. “Rough guide scotland” has 50 searches a month. Now remember these are people in American searching about Scotland. A “travel guide to Edinburgh” may only have 100 searches a month but it’s easy to rank for. Someone who is the USA looking for a travel guide to a city in Scotland would seem to have some kind of travel intention. 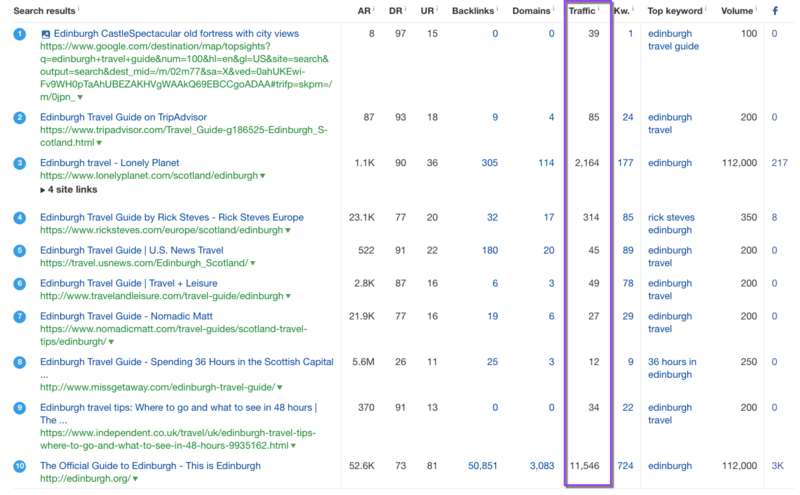 And a good page of content about a travel guide to Edinburgh will rank for more than one search query. Average top 10 result gets 1431 visits a month. Although a couple of pages skew that estimate. As you can also see many of those pages rank for 20 or 80 different searches. I’ve picked the 5th result. When it comes to your next website project or blog post figure out what people are searching for and the intention behind the search. 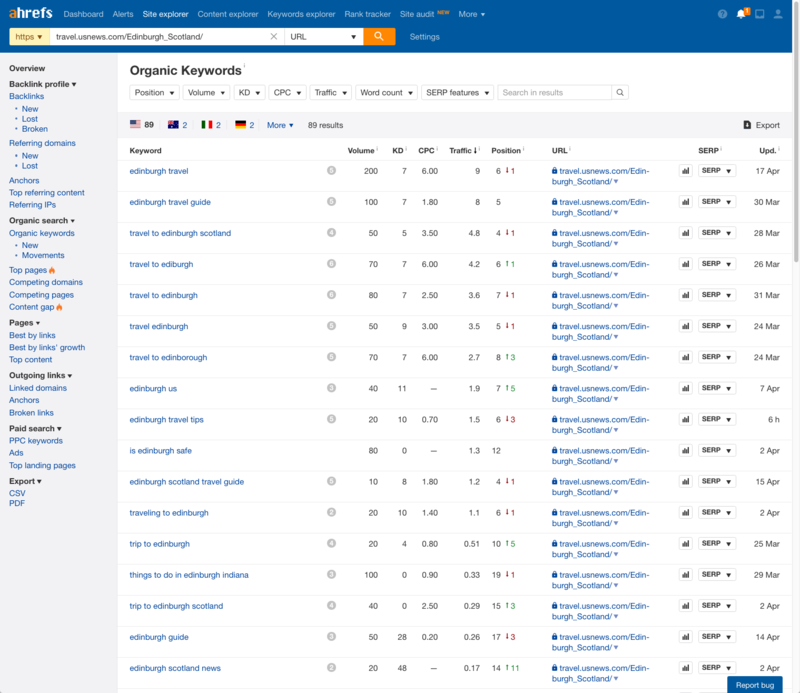 If the search volume is sufficient, the keyword difficulty is low and people click organic results that’s an opportunity. Then create your content by answering the searchers question with a better answer that the other web pages. Follow the above, you’ll need less link building and Google and users will reward your web page and site with higher rankings and organic traffic. Enter your name and email to download this guide to finding search queries with commercial intention.